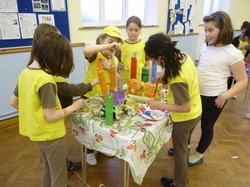 2012-2013 Activities - 14th Birmingham Brownies (Sandon Road). Amongst all this activity, we also did flower-arranging with plenty of help from Liz Wallis and decorated the church with Harvest themed stained glass windows. Christmas crafts and gifts were completed, World Culture and Agility badges were gained and Promises were made and renewed by Brownies and Leaders. New Year quickly came and found us thinking about promises and what they mean before we started on our latest challenge - all about Disney. We played charades, chose our favourite Disney character, made a board game and many other things. All of which took longer than we thought and I for one was glad when the badge was complete. Swimming with 72nd Brownie Unit has become an annual event which allows the girls to achieve their Swimmers or Swimmers Advanced Interest badge. Thanks go to Emma for continuing to invite us. Again we held a cake sale for Christian Aid which was as popular as ever and we raised over £55. Rainbows and Brownies do like cake! Our second Brownie holiday in June had a theme of animals chosen by the girls. 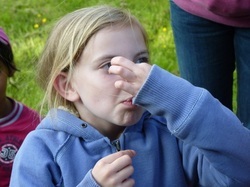 Jason from Forest schools joined us and we made clay sculptures, nettle crisps and ate bugs! (Ugh!) Again the sun shone and we had a great weekend at Trefoil Croft. A number of girls completed Brownie Holiday Advanced once we returned to Brownies. Others gained their Brownie Holiday badge. Not being put off by the length of challenge badges we undertook The Mexico Challenge badge which came in and out of the programme during the summer term. We had so much clay left from the holiday that we used it to make something typically Mexican. (Usually a hat or maybe a cactus for the more adventurous) All our challenges include food, thanks to Tracy and Liz, the girls made Quesadillas but didn’t quite manage the smoothies as the machine exploded! On our last night of term we held enrolments and said goodbye to 4 girls to guides! I’m sure they’ll enjoy it. As ever, thanks are due to the church, leaders, parents and of course girls who make Monday night such an enjoyable time for all.